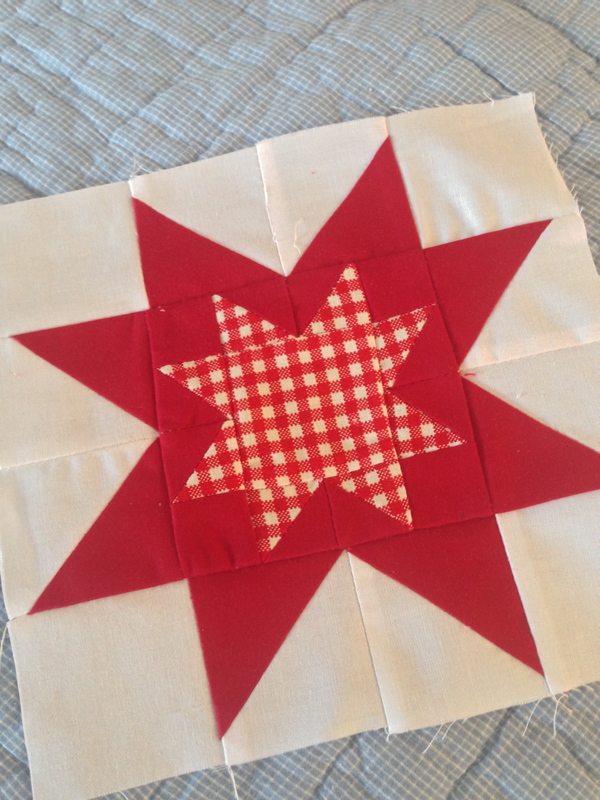 I made some red and white stars for a Christmas table runner that may not get done this year… so sharing some pictures of the work in progress. 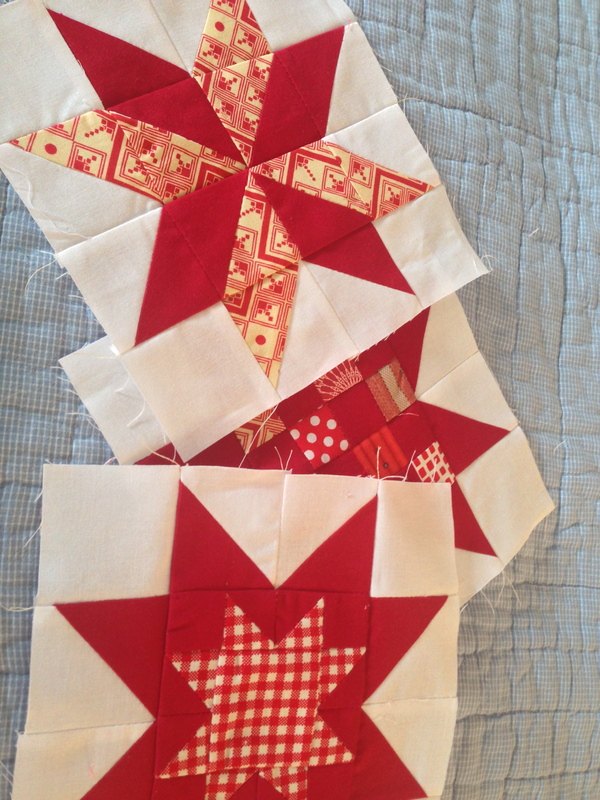 I am happy with my piecing accuracy on these… it is getting better. Not perfect, but better. Not ready to face all those on-the-bias cuts of Moda Modern Blocks, but better. And I love the red-and-white color scheme. The first time I have used white as a background – starting to see the point. The red is Rich Red by Kona – quickly becoming one of my favorite colors, especially since I can buy it from the Joann down the road. 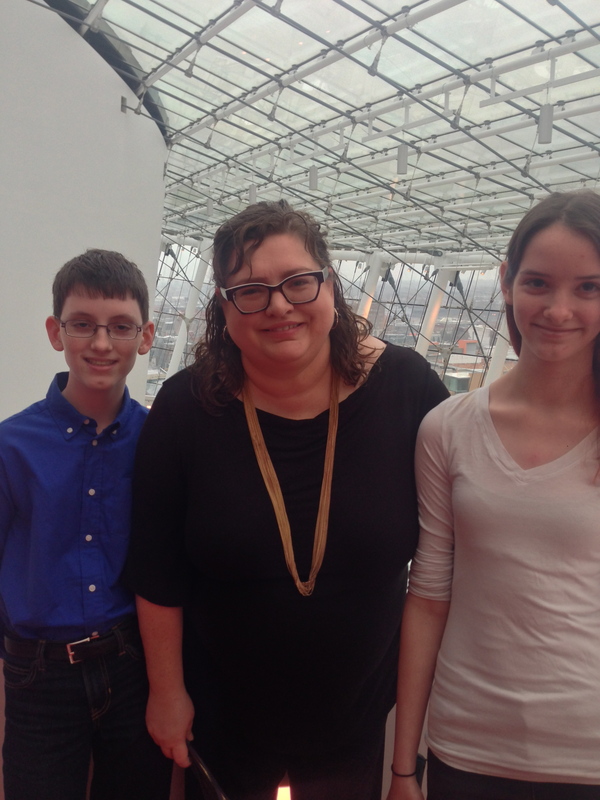 On Sunday, DH, the kids and I went to see Mannheim Steamroller at Kauffman. The music was pretty and Kauffman was gorgeous, as always. And there was lots of Christmas good-feeling… I think I might be totally down with Christmas this year! So my new Juki meant my ability to free motion quilt without crying. I just could never do it on my old machine. It made me very sad and frustrated and jealous of those who could. I practiced a few nights free-motioning. Being a not so good drawer, I am not that good at free motion. My stipple still looks like “creepy fingers” (to borrow a phrase from Elizabeth Dackson). But I was ok at the wood-grain pattern. 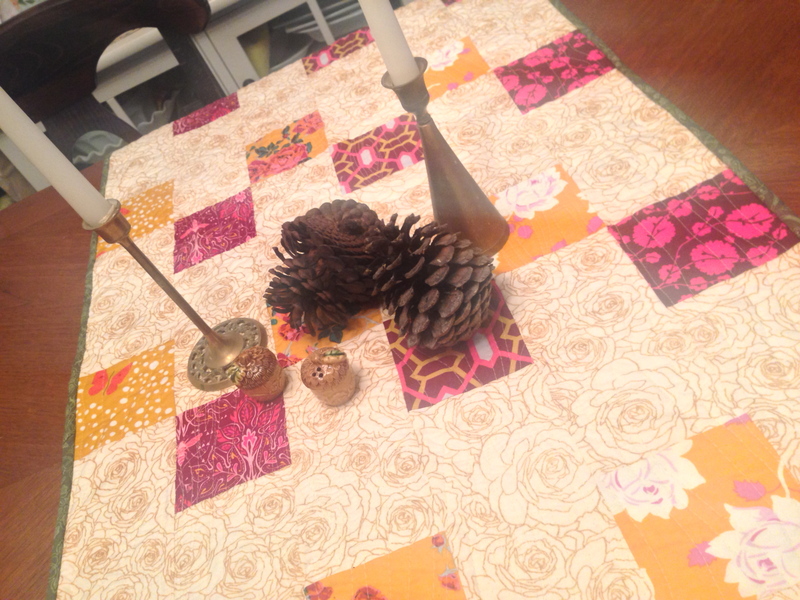 And so I made a simple table runner and gave it a whirl. SO. MUCH. FUN. So, so far from perfect. But good enough that I didn’t get sad – and felt like improvement was possible. 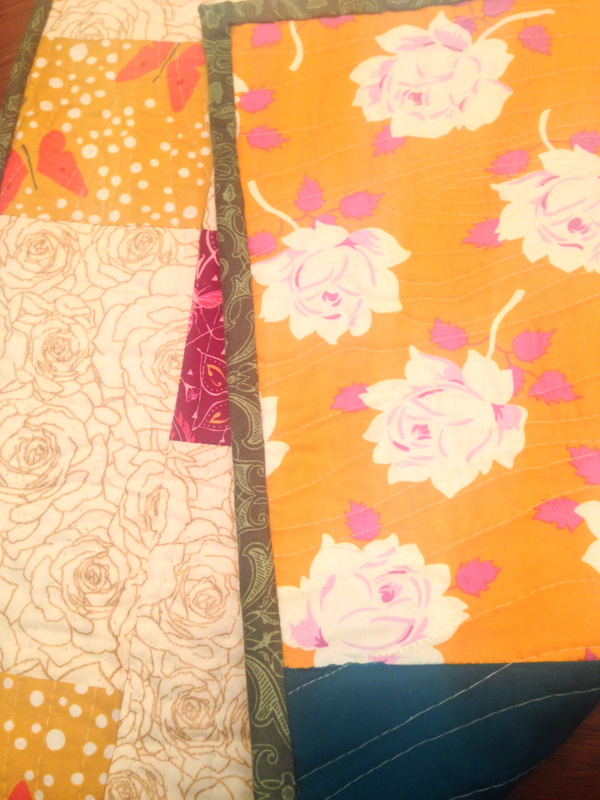 I am not quite ready to try anything bigger – still the world of sad straight-line quilting for me there. But there is a tunnel and there is light. Woot. I have had the top done on this quilt since this summer. I kept waiting for enough money to send it off for quilting. And then I realized that there were much bigger priorities for our money, and decided to power through finishing this one. DH helped me baste. Which was very challenging because we don’t have a hard surface big enough for anything over 60×60. 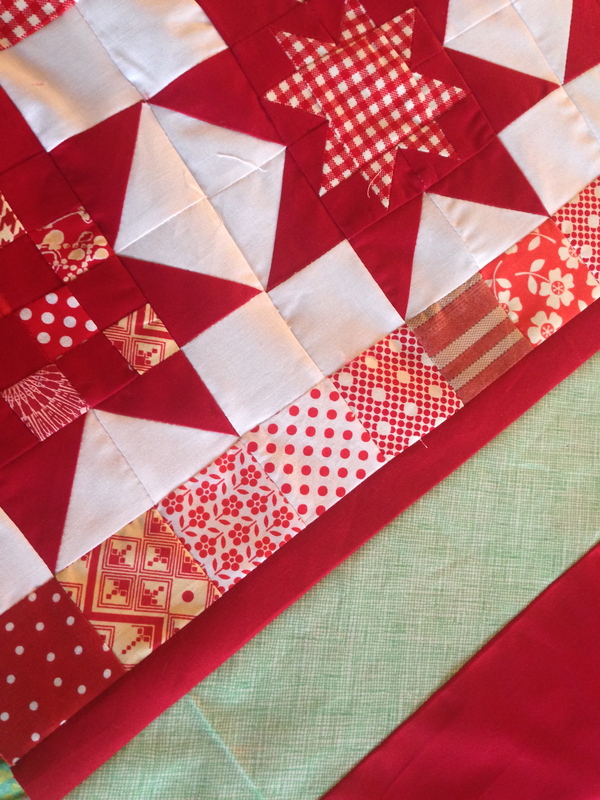 And so there is a minor error in the quilting because of a basting problem (a small section of blocks form an hour glass rather than a rectangle). This was the first thing I did on my new Juki, using the walking foot. I don’t like the walking foot. It is LOUD and the only real problem with my new machine. I now know that the standard foot is enough pull for the thin batting I use. I was dissapointed with this quilt when I first finished it… but now I am falling in love with it. It is soft and warm and friendly and big. The sort of quilt you reach for again and again and again for naps and cuddling. This weekend I finally stole a few moments to get some pictures. 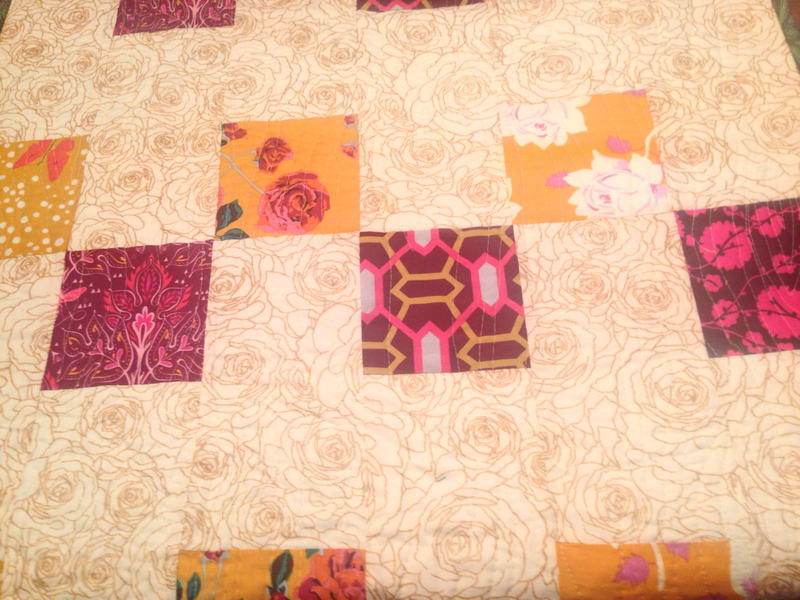 I love this quilt for its imperfections now. 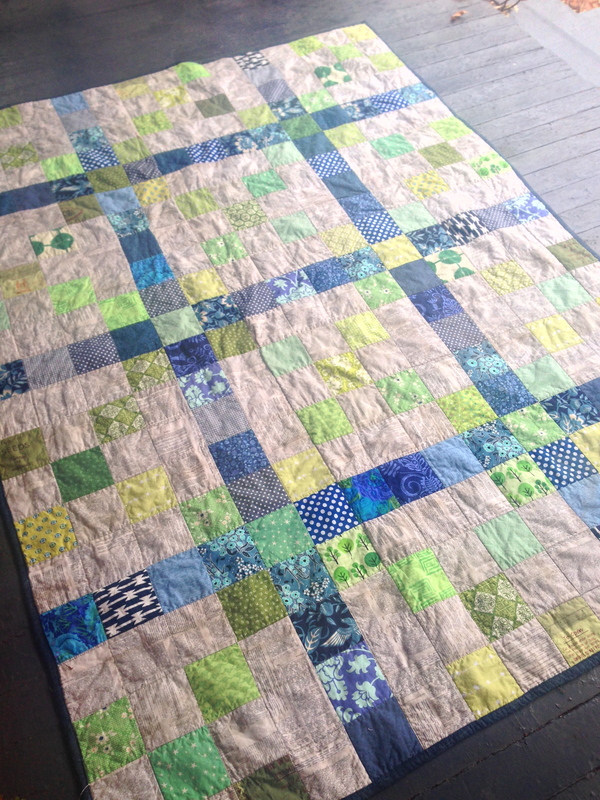 And am glad I have added it to the list of finished-it-myself quilts. It is so easy for me to dread Christmas. There is so much to do. There is so much pressure. I hate decorating the house. And work is ALWAYS extra busy as people rush to get things done before the end of the year. I wanted to make a hanging for my dining room that was Christmas-y, so that I could go simple red-and-green with the decorating. Actually, “wanted” isn’t the right verb… maybe “felt compelled to”. So something I love, quilting, suddenly became very chore-like. Especially since much precious time was fruitlessly spent trying to find inspiration. I finally landed on making a christmas tree out of a bazillion 1/2-square triangles. Do you know what makes me even grumpier than the Holidays? 1/2-square triangles. Luckily, I got inspiration just in time from the Tula Pink City Sampler book. I am working on something that I LOVE. Suddenly Christmas doesn’t seem so bad. These blocks are so fun to make. Quick, unique, and I hope making them all out of green will give a Christmas-y feel, despite all the blooms in the fabric. I pontificated last week about my impatience. My impatience does drive me to constantly look for new challenges. 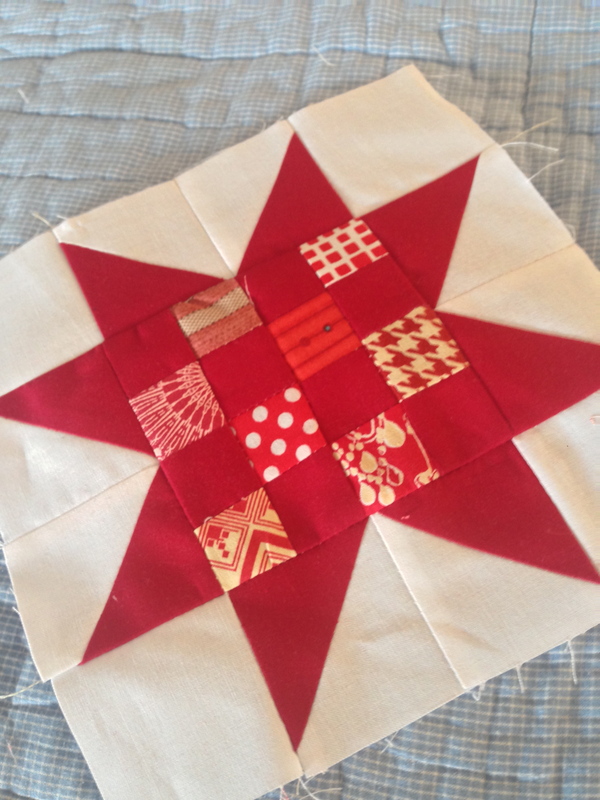 Quilting really helps me with that – there always is something I haven’t done yet and projects to finish. 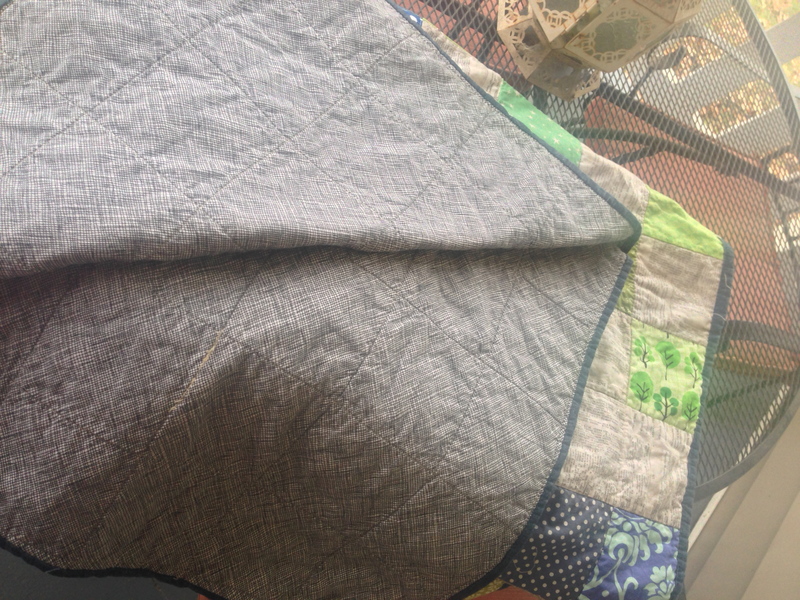 Quilting is still my love, but it has been my all for the past year. As I think about the approaching 2015, I am starting of thinking of broadening my horizons – just a wee bit – but not so much to cut back significantly on my sewing time. 1. Get to know W.H. Auden’s work. I have had some of an introduction through the 44 Scotland Street series, but I want to read his poems, and probably memorize a few. 2. Make a dent in reading Wodehouse’s work. I want to read all of P.G. Wodehouse by the end of 2016. I have read 33 (!) of his books, but that leaves 63 to read – so I should get weaving. 3. Run a 5k. Really, truly I want to be able to do this. An easy feat for most, finding the energy and motivation to do this has been difficult for me. So I would be extra proud of myself if I were to do this. 4. Learn German. DH and I are going to do this one together. I tried to learn Hindi last year, and it was too challenging for me. I am not “naturally” good at learning languages, even when I was younger. And I learn by reading, and the different character set had me befuddled. DH already knows French, was interested in learning German. So German it is. And doing it together seems like fun (although he is a whizz at languages and I’m sure will progress more quickly than me). And then there are all of my quilty goals… I have projects I want to finish up this year and start next year with a fresh slate. 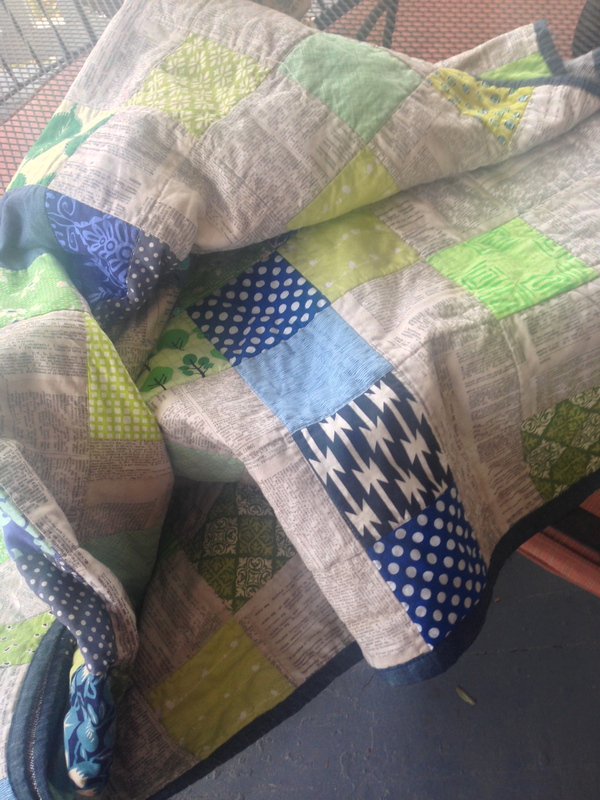 This year was all about Project Linus and gifted baby quilts. 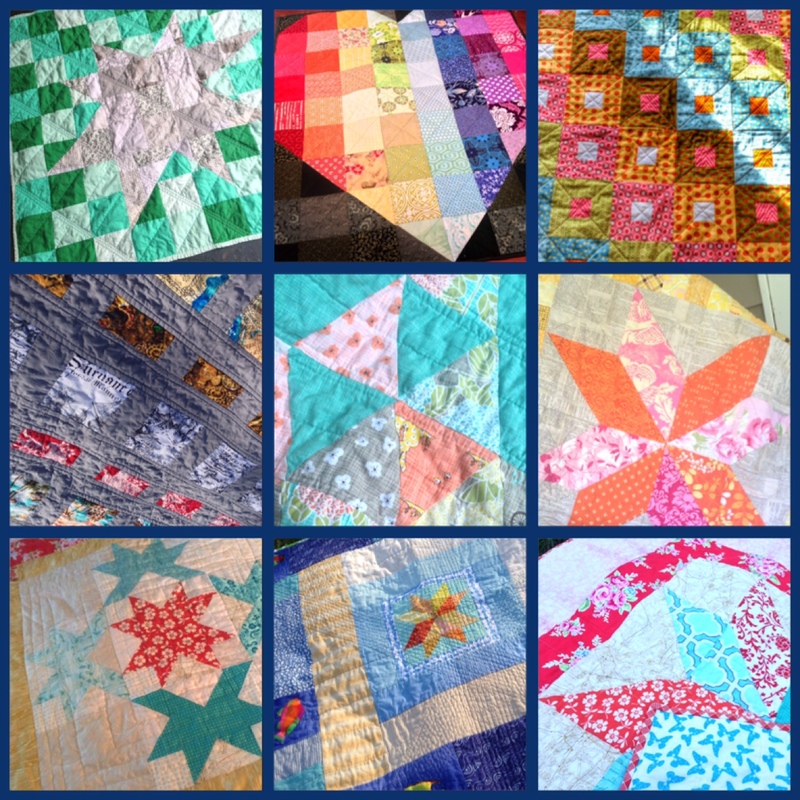 Next year I want to see if I can make some quilts to sell. With my new sewing machine it might just be possible. And I also want to take my time with some great samplers and bigger quilts – gypsy wife in blues, Allison Glass’ celestial paper-pieced quilt, the Moda Modern Blocks sampler. 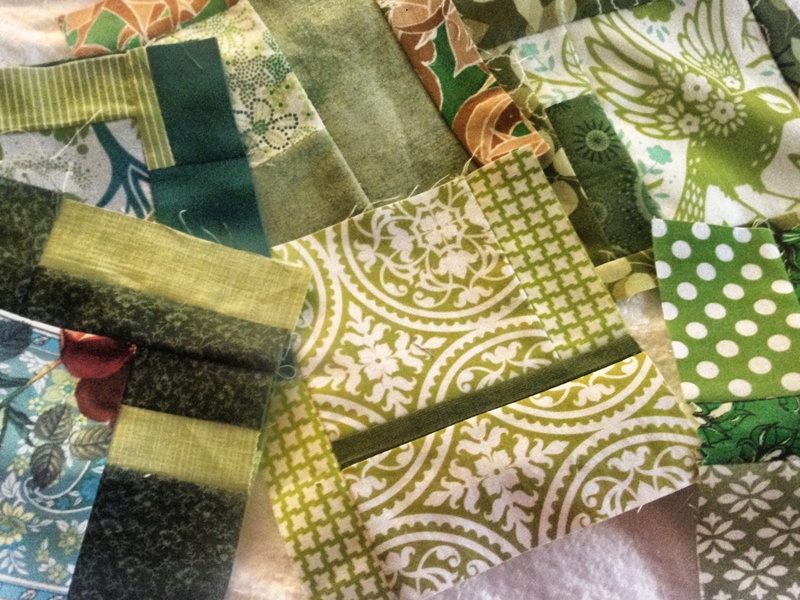 By the end of the year I am on pace to have completed 54 projects – more than one a week. I am not sure that pace will continue next year, so I am keeping my aspirations small. My wish list is down to only 14 things right now – which is unprecedented. ghrn on In love and in 2018! 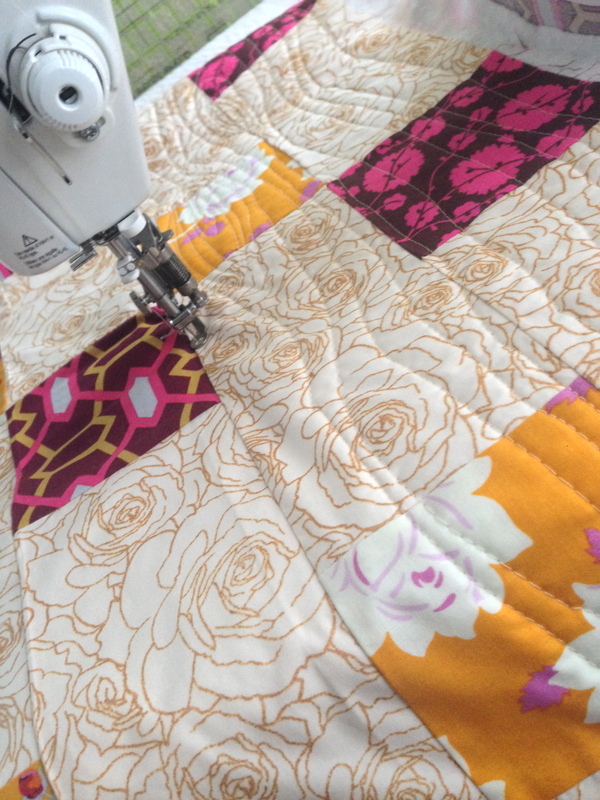 The Joyful Quilter on In love and in 2018!